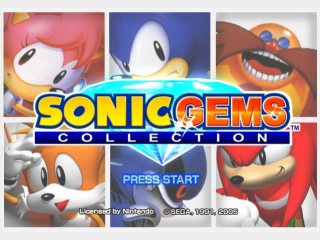 Sonic Gems Collection (ソニック ジェムズ コレクション) is a compilation of more obscure Sonic games. The compilation is a Nintendo GameCube exclusive in the United States, but has also been released on PlayStation 2 in Europe and Japan. A Xbox version of the game was planned, but was later canceled. The PlayStation 2 version contains both Japanese and American regional data, including different released manuals scans and alternate and differing versions of games (for example, Sonic CD has both the Japanese and American soundtracks). The game will load the data depending on the language the console is set on. The GameCube version only has the language for the region of release in the game data. 6.2 Sega of Japan, Inc.
6.6 Sega of America, Inc.
Sonic Drift 2: Sonic Drift 2 keeps its multiplayer mode. Only the Vectorman games are available outside of Japan in order to keep the ESRB's "Everyone" rating. Games from Sonic Mega Collection Plus can be unlocked in a "demo" form. These are actually the full games, but play automatically begins at the last level or final boss with a time limit imposed on play time. There are cheat device codes available which will freeze the time limit, allowing the game to played through fully. The US/European version has the US soundtrack for Sonic CD, whilst the Japanese version has the Japanese/Europe soundtracks. The hints for Sonic CD place the debug mode sound test code with the other hidden pictures. The water in Tidal Tempest in all time zones is clear. On the Mega CD and PC versions, the water was colored differently in all time zones (Present was green, Past was brown, Good Future was cyan, and Bad Future was red). The reason for the clear water is because this is a port of PC version. The PC version used 256-color mode, which uses a palette, similar to the original Mega Drive VDP. Consoles with modern GPUs don't properly support palette effects, so instead of rewriting it to work correctly, the palette effects were simply dropped. When originally released in arcades in the US and Europe, it was renamed Sonic Championship. In Gems Collection, the title of Sonic the Fighters was used for every region. Model data of all unused characters was removed. Character data still exists, but upon selection, the game crashes due to missing models. 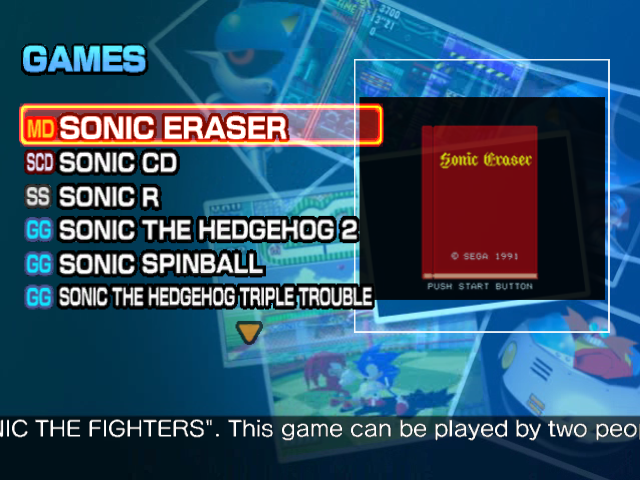 Due to the limited amount of controller slots on the PS2, Sonic R's multiplayer mode was reduced to two players from the possible four on the PC version. The GCN version preserves the four player capability from the PC version. The draw distance is greatly improved over previous versions. Created By: H.I.C Co. Ltd. Created By: Traveller's Tales UK Ltd. This page was last edited on 2 April 2019, at 09:17.